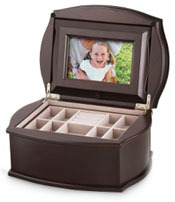 "...for the Jewels in your life..."
Watch every picture on this page very carefully. And as you go through this page, pause briefly on each picture and imagine those special people in your life in it. Imagine those special and rare moments that you spent together. Do you see them smiling and talking to you.? 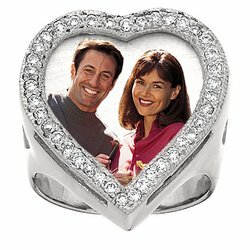 Now just for a minute, close your eyes and feel the emotions, the joy, the moment of ecstasy and a sense of emotional bonding when they would open a real, heart-touching and a surprise gift from you - a personalized jewelry! Now open your eyes, return to this page and continue the journey of your emotions. Let me ask you two quick and simple questions. How many people do you have in your life with whom, YOU feel, expecting something from them is your Right? How many people do you have in your life, WHO feel, expecting something from YOU is their Right? 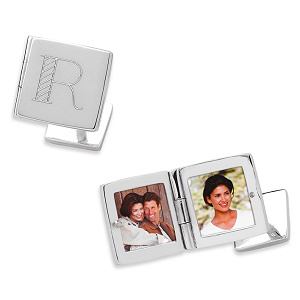 Yes, personalized jewelry is for those rare jewels in your life who mean so much more than just 'relations' to you. And therefore it cannot be anything but 'Special'. And who said that jewelry is just for women? You'll see what I mean by that in a moment from now! 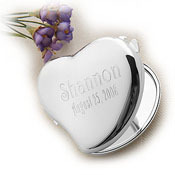 What I am going to do is help you look at different options for unique personalized jewelry and also help you 'Create' it for those special ones in your life. Create it? - Am I kidding? No, I'm not kidding you at all. YOU are going to do it and I'll show you HOW! Oh! By the way, did I tell you that at the end of the page I'll also share with you some of my preferred places where personalizing your jewelry is as easy, affordable and exciting as it can be for anyone?! - Don't forget to take a peek there! 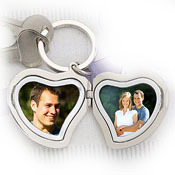 Personalized photo pendant can truly be a most touching gift for any lady. Well, Firstly, it is a proven fact (proven by the ladies in my life!! - My Mother, My Sister, My Wife!) 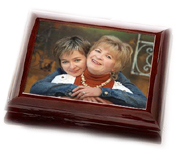 that ladies are much more emotionally attached to their family than us - the men! Don't get me wrong on this, but that's the truth! Secondly, did you ever realize where exactly does a pendant rest, when worn? That's correct! - Right next to Heart. Well, for anything to be able to get that close to her heart, it has to win her heart first - like YOU did! And just how can you win her heart? No-No!.. 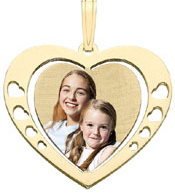 not the heart - the pendant! Her Heart is already personalized by your Love! - isn't it? 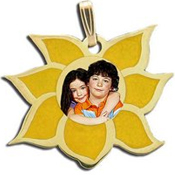 It is the pendant that I am talking about!! 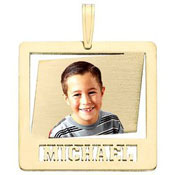 Personalize that pendant with the most memorable photo that you ever had. 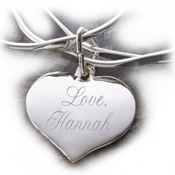 Here are some of the reason why you 'should' present her a personalized pendant. Imagine she bore the fruits of your love and gifted you an angel, a beautiful child who changed your whole life and the way you looked at life itself. 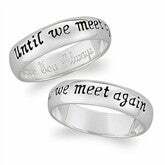 OR let's get a little romantic! So you both are having the best of time. A candle-light dinner with a soft music in the background is tempting your emotions!! You reach out and offer her your hand as a gesture of invitation to dance. She smiles, gives in to your invitation and there you are - dancing to the tunes of the most melodious love songs in your life. After a while you ask her to close her eyes and all of a sudden your hands go (no! don't stop here - keep reading!) around her neck (that's correct:)) and you ask her to open her eyes now. 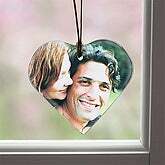 What she sees around her neck is a gift of her love, the heart of her life. And what exactly is that? - Well, I leave it for you to think about it!! Here's another reason and this is one of those "First(s)!" in your life! What if it was just to celebrate your Kiss! - your First ever Kiss!! A kiss that left you dreaming about it for the whole day and in return gifted you uncountable sleepless nights!! 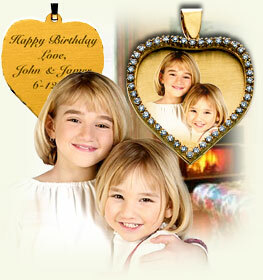 Imagine how would this photo look like in her personalized photo pendant!? Remember - Moments you live today are memories for tomorrow. So treasure them as if they were your life and wear them each day so that they are always fresh in your mind and heart!! Be it your marriage anniversary, the birthday of your darling, first day of your angel at school or the day when it all started - your engagement ceremony! 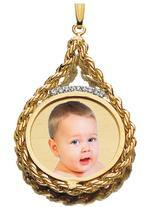 - Named Jewelry can always do the trick! 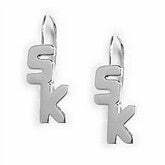 Anyone can buy a jewelry but when you add name to it it is then that it truly becomes "specially for her/him". That's what's called - Magic! Several years ago, I was gifted a silver ring by my sister on my birthday. The ring had my initials on it. Several years later, I was gifted another ring. This time, by my wife on our marriage. 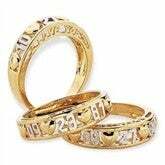 That ring too had my initials on it. Today, when I look at those rings, it makes me think that they both could have bought the ring from the shop and have gifted it to me. 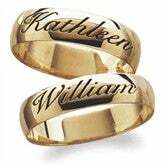 So what was the need to request the jeweler to add my initials on the ring? Well, I wish I had words to explain that to you. I wish I could tell you how I felt when I got those gifts. And I wish you were there to see how they felt when they saw that smile on my face. Though it was just one character on each of those rings, but that single character carried all their love and affection for me! 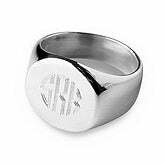 My ring has just my initials on it and it became my best jewelry, what if you could add your photo to your ring? Just imagine for a second!, how much would he/she be moved by your personal touch! True, anyone can buy a ring but it is these 'seemingly small' gestures of love, affection and care that make all the difference - Think about it! 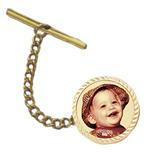 Personalized Cufflinks and Photo Tie Pins! "Wow'! - that looks great! - I'm sure that would be your beautiful wife and that little angel is your adorable daughter - isn't it?"! And he, as proud as he can be, would smile, nod and say 'Yes, they are'! Can you imagine how would he be feeling at that time? 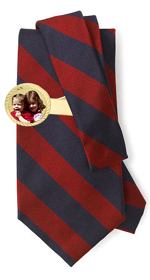 Well, that's because of your beautiful and thoughtful photo tie pin gift that made him and his tie the center of attraction for the whole world!! And If that's not enough, step a little deep and add a bit of sparkle to his eyes by your new ideas! 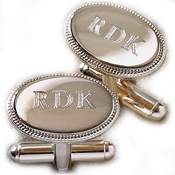 Pull up his sleeves and instead of regular buttons, add a photo cufflink that has your and your fruit of love (that's what I'd call your child!! ), your angel's photo's in it! 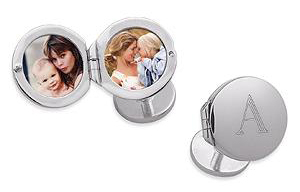 So the next time he wishes to see you, he just needs to flip open that cover from the cufflink and there you are - his love - his life - his whole world! - right in front of him - as if to say - I love you, I am always there for you - just a flip away! Now that's what I call a gift of 'True Love'!! Do you know how did the word 'Bracelet' come into existence? Well, its origin is from the Latin 'brachile' meaning 'of the arm'. As we know the bracelet is worn around the wrist (of the arm! ), hence the name! Initially, bracelets were worn as a form of jewelry and were made of stone, bone etc. All around the world, bracelet has its own cultural significance as well. For example, I can site two most significant events from my own country - India! In India, a new born baby is made to wear a bracelet of black and white colored beads to protect the child against the evil eyes. Another BIG event in India that revolves around bracelet is a festival called "Raksha-Bandhan". Raksha-Bandhan is a festival where sisters tie a bracelet (called Rakhi) around the wrists of their brothers. 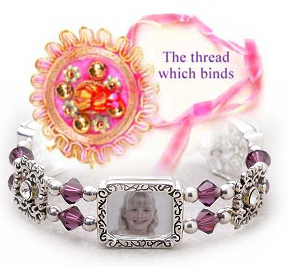 Originally, Rakhi use to be a simple thread, but now, it has taken a form of bracelets etc. Rakhi is a symbol of love and emotional bonding between a brother and sister where sister ties a knot to seek protection and brother vows to look after his sister and protect her from all the evils. Such is the meaning of this simple thread for a Brother and Sister in India! Like-wise, several other countries and cultures have their own individual significance tied around 'Bracelet'! 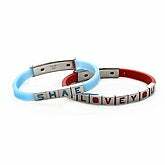 Bracelets can be presented to women and men both. 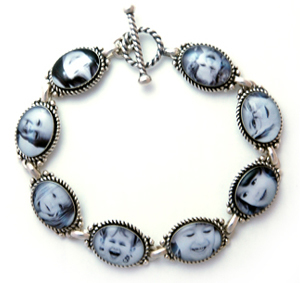 And if we talk about photo bracelets, it is even more special because it contains the photo of people or even the pets you love! 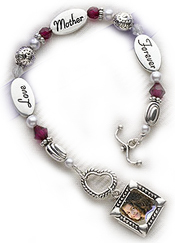 Who would not like to wear a bracelet that holds the picture of someone they love? 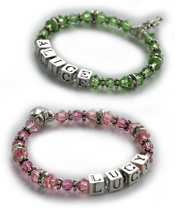 Imagine giving this bracelet to your mother or grand mother on her Birthday! 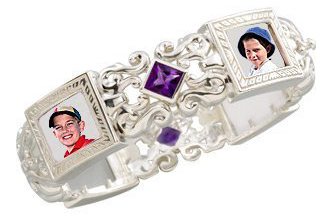 I'm sure she'll be thrilled and would jump back to life on seeing those gems of her life in that bracelet. He said - "Time is precious"
I asked - "How much precious?" "As precious as my watch! ", he replied! ...and showed me one of the most beautiful and unique watches I had ever seen. 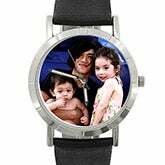 The watch had the photo of his son and daughter with his beautiful wife!, on the dial of his one of a kind watch! Well, that was my dream I saw last night! But that's the answer that I can see you giving if you'd be wearing one of those precious watches on this planet! 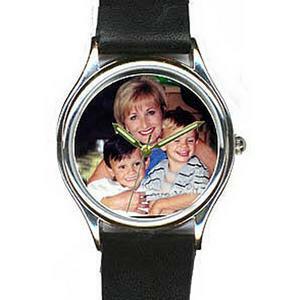 Now, It is not only with pictures/photos that you can personalize your watch. You can also scatter your fragrance of love in words!. 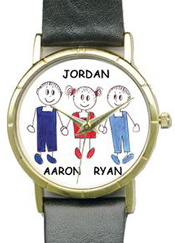 Engrave a little personalized message on the back of your watch and make it memorable! 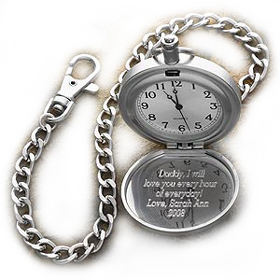 If the watch has a cover that flips open, you could engrave your expressions of love over or inside the cover also. Look at the watch on the side to get a better understanding of what I am trying to say! 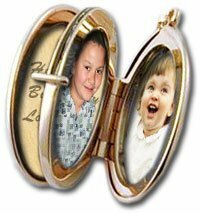 Did you ever observe how much care does your little angel take of her little jewelries that you gift/gifted to her? If you did observe, then you must be knowing how much attached she is to all her belongings. That's the attachment that I always talk about. 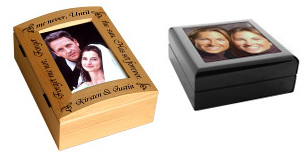 Just imagine how much more that box would mean to her if you could personalize it for her? They say "One must not judge a book by its cover". But I say, you can easily judge the feelings of the heart that gives such a personalized box full of emotions. 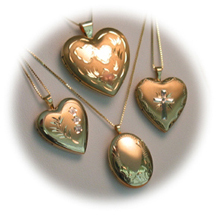 Believe me, if the gift giver has taken that much pain, the gift and the heart of the gift giver are worthy of being weighed in solid gold! 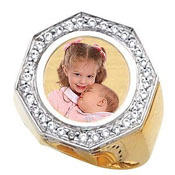 You and I both know how precious is your personalized jewelry, then why not keep it in a place which is as precious as the jewelry itself? If it does not exist yet, then create one but don't underestimate the significance of having it! 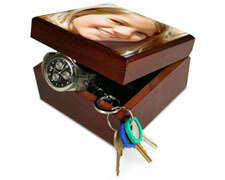 - Your very own personalized jewelry box! 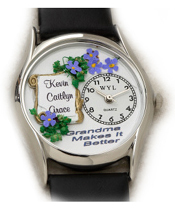 Do you think she can't buy personalized jewelry for herself? She can - by all means she can, but what if she is just waiting for you to gift it to her? What if she doesn't want to say it? What if she feels that you'll just 'understand'? You know, a gift from someone close and special has its own special place in the heart of the receiver. Moreover, we only have but very few people in our lives from whom we expect something and consider it as out right to expect - Right? So what if she is just expecting something from you? 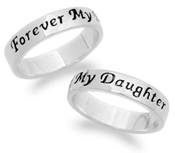 Well, if you are somewhat like me you probably might have already thought about your next gift for her by now. 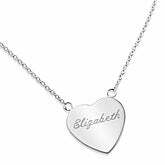 So this time around, surprise her with your most thoughtful gift for her - a personalized jewelry of her choice! But, remember, surprise is the key to the best gifting experience! 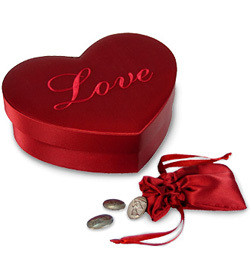 So whatever jewelry you choose for her/him, gift it as a surprise. You'll be amazed at what you get in return!! And once you get something in return, don't forget to share it with us (Of course you don't have to tell us 'everything' though !!! - We do understand that 'some' things are personal!!! :) ). As I always say, my endeavor is to bring the best to you, your family and all those whom you love. If I could prove myself of any help to you, I'm glad and thank you for taking time to be here. If not, please do not hesitate to write to me about your experience on this site and help me make your next visit - more productive, effective and - Memorable! Please subscribe to our monthly newsletter, Emotionally Yours and get information on how YOU can master the art of gifting. A monthly update you just can't afford to miss!